This portal highlights WikiPathways content related to human disease, and is designed as a central organizing point for exploring, curating and expanding the collection of disease pathways. On the right, you'll find a curated set of Featured Pathways, representing all human disease-related pathways at WikiPathways. On the left, you'll find a Search box to help find pathways by keywords or gene names. Below, you'll find information on how to get involved with pathway curation, to help improve and expand the WikiPathways collection of disease pathways. Public resources for pathway information: BioCarta, KEGG pathways and Wikipedia. Suggested topics: Endocrine and metabolic disease, infectious disease, addiction, immune system disease, neurodevelopmental disorders. Pathways from Blau et al. 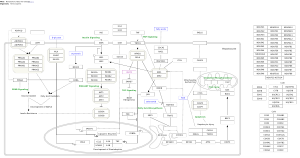 View all Pathways digitized from Physician's Guide to the Diagnosis, Treatment, and Follow-Up of Inherited Metabolic Diseases by Blau et al. The list of Featured Pathways is not static and can be updated at any time. If you know of a pathway that should be added, please contact Denise Slenter. This page was last modified on 16 October 2018, at 05:34.